To understand how to lose body fat fast and keep it off, you need to keep in mind that when you consume more calories than you need for immediate energy, your body stores the caloric surplus either subcutaneously (more visible) or internally, as visceral fat (much more dangerous for your health). And that’s where the full understanding of how to lose body fat efficiently and the 2 vital weight loss tips (which we’ll talk about in a moment), come in handy. If you think the choice of NOT storing fat is the obvious choice, think again. Your metabolism is genetically programmed to make you store as much body fat as you can, as soon as you have a chance. Also, to hardly give it up – this may be a new idea to you, but it’s true. This ancestral protection mechanism is known as starvation physiology. And whether you like it or not, this mechanism is still at play today. To fully understand how to lose body fat faster, you need to know one more very interesting thing about the cells in your fat tissue… During childhood, along with developing muscle and bone structure, body fat cells are also created. They are tiny balloons that store any extra calories as fat, as seen in the image below. When your caloric intake is constantly higher than your caloric expense, your body fat cells gradually fill up with fat. They grow bigger and bigger, and as they reach their maximum capacity, new ones are produced. Physiologically programmed to be always full, your fat cells provide you instantly with the energy you need when food is not immediately available. As you burn body fat, your fat cells get smaller. However, they NEVER go away – unless they are artificially removed from the body through liposuction. 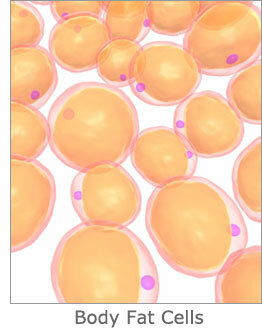 So, while you might be joyfully celebrating the loss of fat, your empty, little fat cells are not happy. Programmed to continually replenish their fat stores, they start sending out frantic signals of starvation: sharp hunger pangs and unstoppable food cravings. These signals are picked up by your brain, which according to the deeply ingrained survival mechanism, reacts by lowering your metabolism to conserve more energy. Impeccable physiology – utterly outdated. However, it’s the reason you might fall into the sea of people who don’t fully understand how to lose body fat – or who after losing some initially, get it back shortly, on even fewer calories. Once you start to alternatively lose and gain back body fat (like in the case of yo-yo dieting), increasingly more fat cells accumulate in your body. The more fat cells you have, the harder burning body fat becomes. There’s one more thing you need to know. If you were overweight and developed more fat cells as a child or teenager, your chances of becoming overweight as an adult are increased by 70%. I know, it’s completely unfair! So, how to lose body fat efficiently when all seems to be against you? The secret is to keep your metabolism up. When your metabolic rate is high you burn (rather than store) the excess calories you may eat in any given day. Easier said than done. How do you keep your metabolism high? Just read on. To keep your metabolic rate high, be sure to not cut more than 1/4 of the total number of calories you’re currently eating. Why? Because drastic calorie-reduction always triggers your body’s starvation physiology, which slows down your metabolism in an attempt at preserving the fat. So, for example, if you now eat about 2,400 calories/day don’t go under 1,800 calories. Eating healthy fats insures you don’t have (or develop) an essential fatty acid deficiency, so mitochondria can boost the thermogenesis in your brown fat tissue. Limit the foods high in saturated animal fats, like processed foods, cheese, milk, and fatty red meat. Instead, include healthy fats like flaxseed oil and fatty fish, which are rich omega 3 sources. These healthy fats restore the optimum fatty acids balance in your body. As a result, the mitochondria are quickly re-activated, revving-up your metabolism and helping you burn more body fat. And here’s how to lose body fat even faster. Take daily 2-4 grams of Gamma Linolenic Acid – GLA is a potent omega-6 fatty acid found in borage oil, evening primrose oil, and black currant oil that further improves your body’s balance of essential fatty acids, vital in burning body fat.